As soon as a child joins the school, we consider their parents to be members of the PTA, which plays a large role in the school community. The PTA consists of officers elected at the AGM towards the beginning of the school year, and other willing volunteers. Fun, informal meetings are held about every half-term. These meetings are advertised on the notice boards in the infant and junior playgrounds, and by text message. Anybody is welcome to attend. It is an excellent way to make new friends, but is also a way of helping to raise much needed funds for the school and your children. 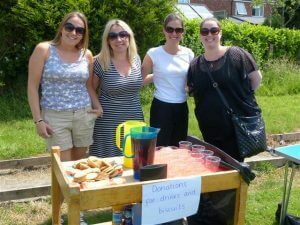 The PTA hold many regular events – Christmas and Summer Fairs, Discos and a Summer Picnic. We also have had clothing collections, toy sales, and even a circus has come to visit. These events raise over £4,000 each year. With this money, we have purchased blinds for the school hall, new dining chairs and tables in the canteen and contributed towards the costs of painting the classrooms, to improve the school environment. We have also bought outdoor play equipment for break times, digital cameras, ovens (and trolleys) with baking equipment, new books for the school library, along with a new library computer and regularly contribute towards school trips and visiting actors and specialists. Many thanks to all parents who attend and support our events. Without you, many of these resources could not have been acquired. We regularly look forward to welcoming new members at any point in the school year.